labels, sheilds, key receipt cards, envelopes and book index. A book index (No. 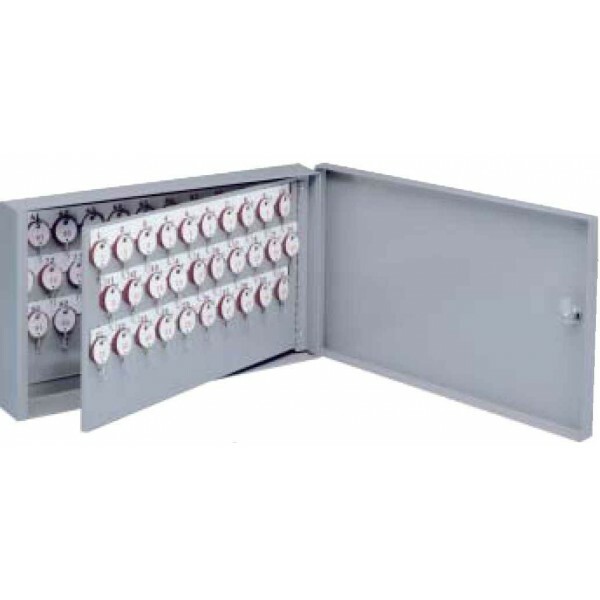 511-B) is furnished with all Lund Deluxe Wall Cabinets with the Two Tag Key System. This index is to be filed in the office letter file cabinet for key security. Panel hooks and key tags are numbered consecutively from No. 1 up. Hooks on panels are 1/2" long and tapered. Wall cabinets are made from 18 gauge office furniture steel with electrically welded construction. Index pockets on the door can also be furnished as a special feature at extra cost. Finish is light office gray baked-on enamel. Doors have plated cylinder locks and continuous piano type hinges.